A friend of mine visited over the spring break with her three kids. 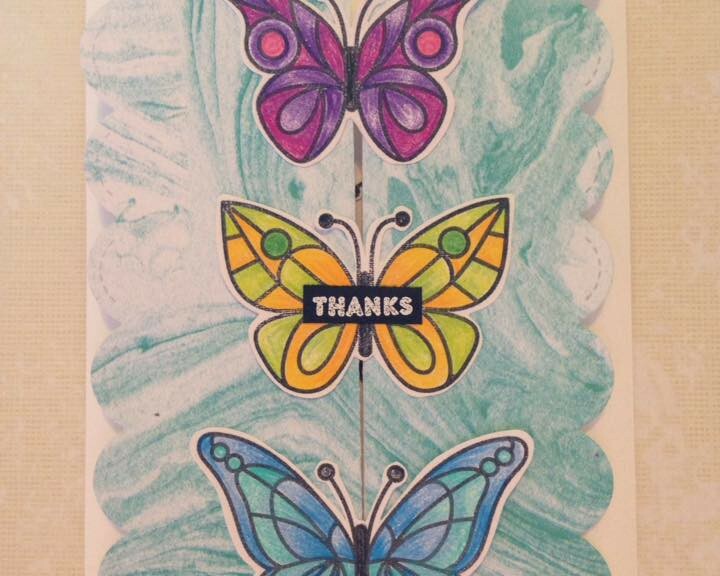 This is the thank you card that we sent to them after the visit. 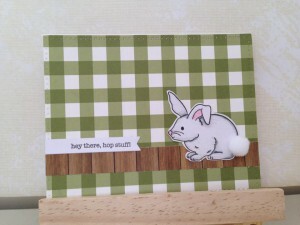 I have been loving the little kiddos from Lawn Fawn’s Easter Party set. 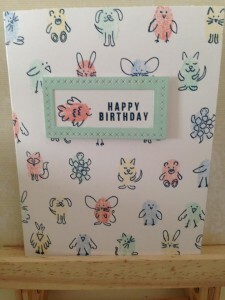 Extra Details: I began this card by stamping and coloring the three little kids on a scrap of white card stock. I used Prismacolor pencils to color the kids in. 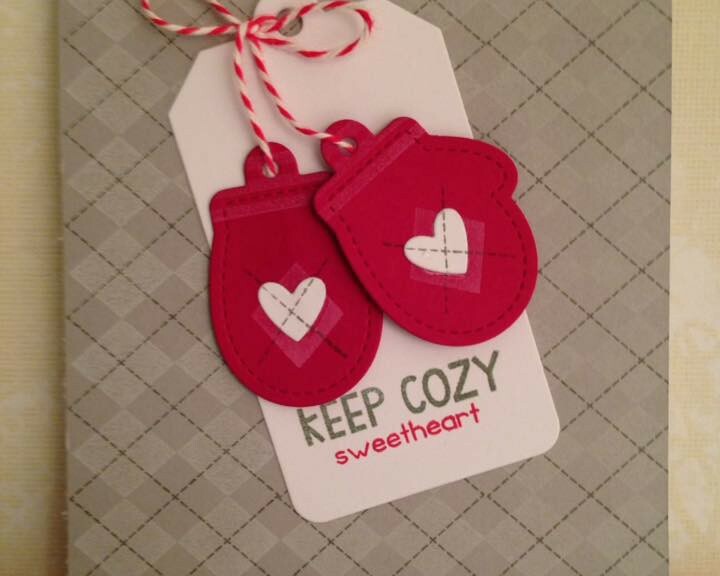 I fussy cut them out leaving a small white border. 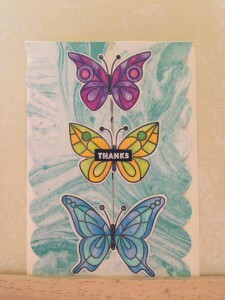 I used some water color paper and four shades of Distress Oxide inks to create the center panel. I smooshed the ink on my acrylic block, sprayed it with water, and then smooshed it on the water color paper. I let the block sit for a few minutes to intensify the color. Then I removed the block and let the panel air dry. Once it was dry, I added some more pigment with a paint brush. I flicked the extra pigment on the paint brush around the panel to add interest. To finish the panel, I flicked some water on the panel and blotted it up. Once the water color panel was dry, I die cut it with a cross stitched rectangle die and a script thanks die. 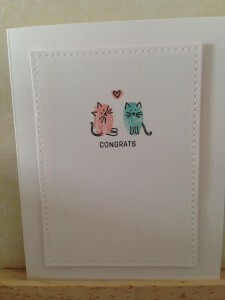 I dry embossed a panel of grey card stock with a dotted embossing folder by Darice. I adhered this panel to a white card base. It was at this point that I decided I wanted t make a shaker card. I adhered some clear plastic to the pack of the water color panel. I lined the edges with foam tape and added the sequins and beads. I used regular tissue paper to close up my shaker element. I used double sided tape to adhere to layers of tissue paper together to make it strong enough. I used a strong liquid glue to adhere the panel to the card base. Lastly, I added the three kids around the panel. Distress Oxide Inks in Worn Lipstick, Squeezed Lemonade, Cracked Pistachio, and Mermaid Lagoon. I made a few card sets to give as Christmas gifts this year, but I never got around to blogging them till now. Here is the blue set of cards I made. 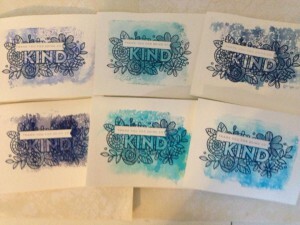 Extra Details: I began these six cards by creating six card bases from some water color paper. Then I used my acrylic blocks to smoosh on some blue Distress inks. I let the ink sit for about five minutes before removing the block to get a more intense color. 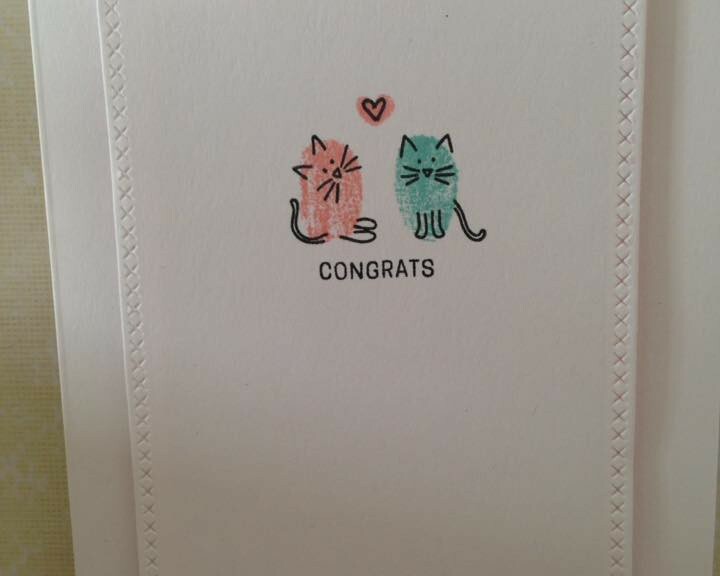 Once the ink smooshing was dry, I stamped the image on to the cards. 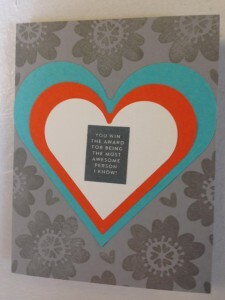 I used Versa Mark ink and Simon Says Stamp’s Steel Navy embossing powder. Finally, I added the sub sentiment to the cards. 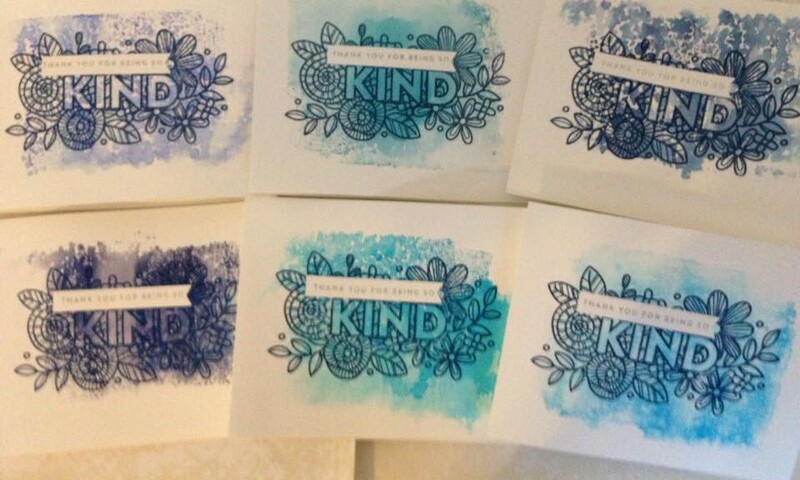 I stamp the sentiment on a small strip of water color paper with a grey ink. Then, I adhered the strips with some foam tape. 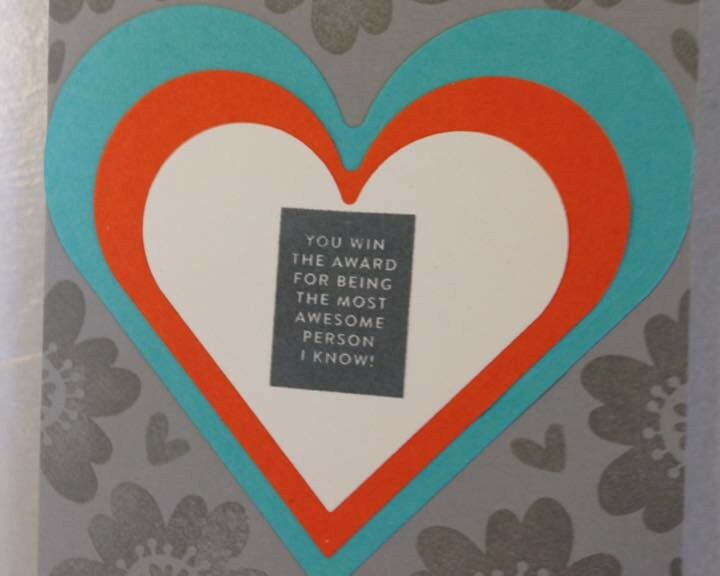 The recipient love this card set for both its handmade qualities and the really beautiful sentiments. 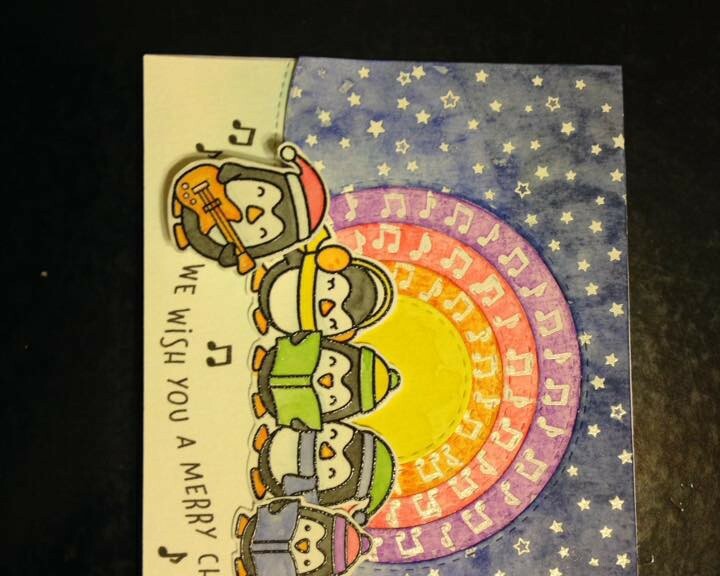 This is the card I made for my kiddos’ piano teacher. It has an action wobble on the front and a hidden gift card on the inside. 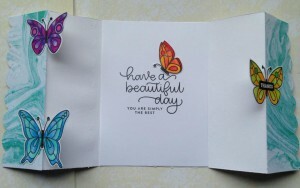 Extra Details: I began this card by cutting two 4.25 x 5.5 inch panels from some water color paper. 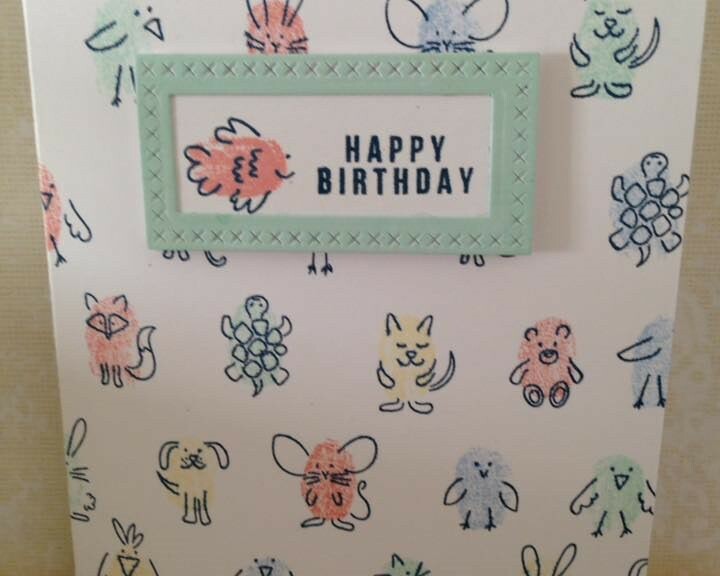 One panel is for the front of the card; the other is for the inside. I used a stitched hillside border to cut the front panel. From the top part of the panel, I also die cut some stitched circles. 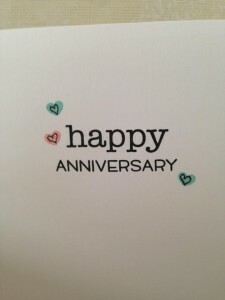 I used versa mark ink and white embossing powder to add stars or music notes. I used Distress Inks as water colors to create my night sky. The embossed resist worked beautifully. I added a light blue was to the bottom of the panel for interest. Once dry, I adhered all of the pieces to a white card base. For the inside panel, I used the Ellen Hudson Zipper Panel Die to create the hidden chamber. I adhered this panel to the inside of the card base. 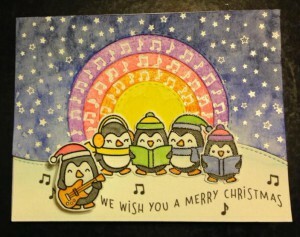 On a scrap of water color paper, I stamped the penguins in Versa Fine ink and clear embossed them. I used the same Distress Inks to water color them in. 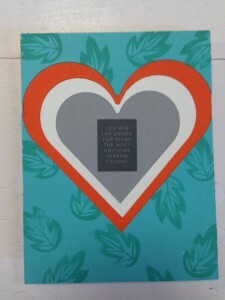 Once dry, I fussy cut everything out leaving a small white border. 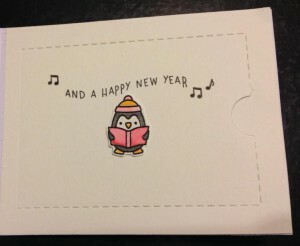 I adhered the penguins to my card using liquid glue. I used a mini action wobble on the penguin playing the guitar. Lastly, I added the sentiments and a few music notes in black ink. My uncle came for a visit and brought my kiddos some chocolate milk he made himself. 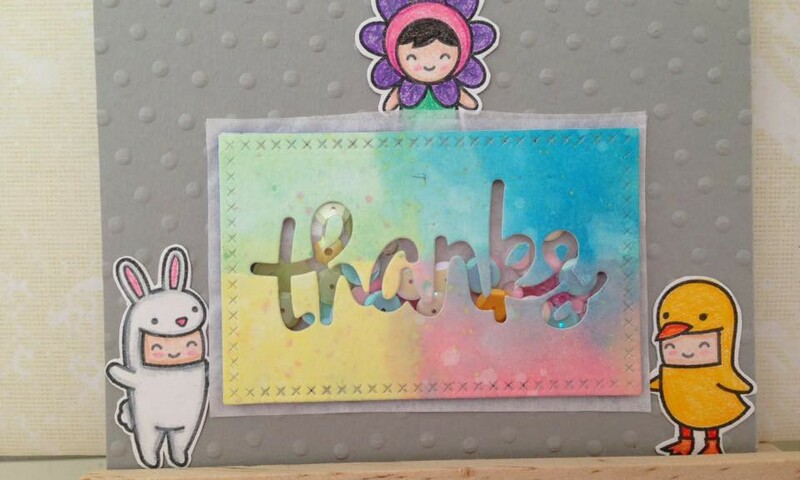 This is the thank you card that I made for him. 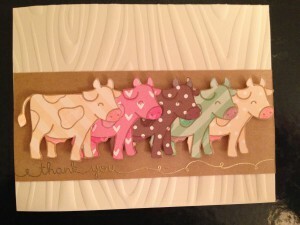 Extra Details: I began this card by stamping the cows on to some Lawn Fawn Let’s Polka Mon Amie papers. 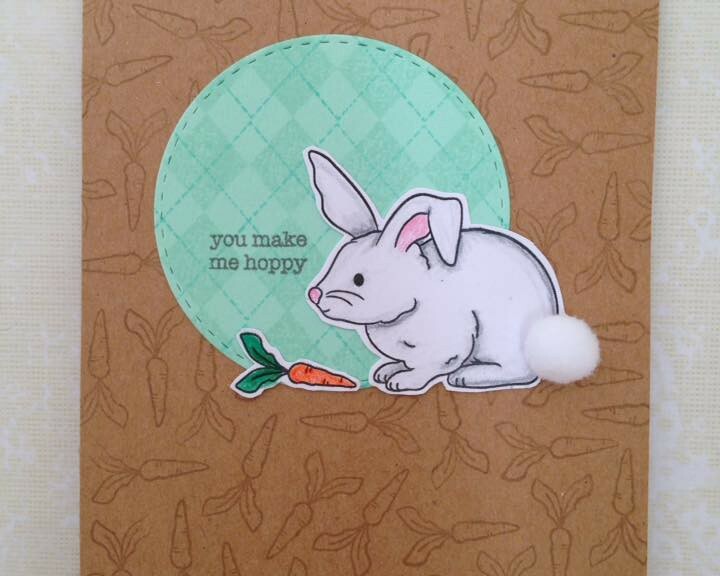 I used Lawn Fawn Doe Ink. I fussy cut each of the cows out. 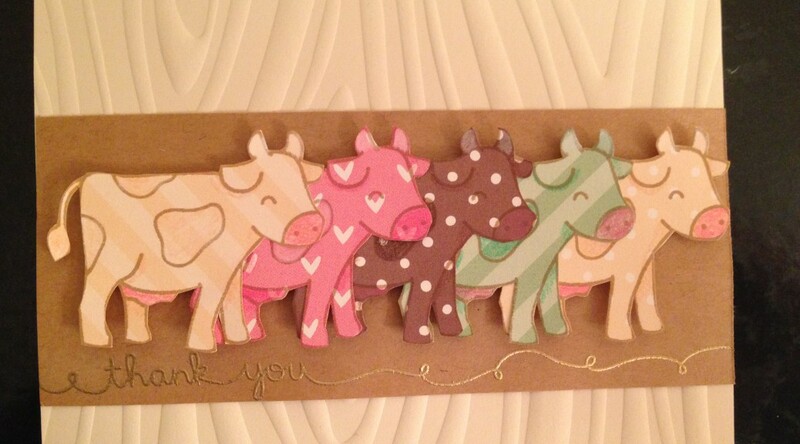 I used colored pencils to add some shading and detail to each of the cows. 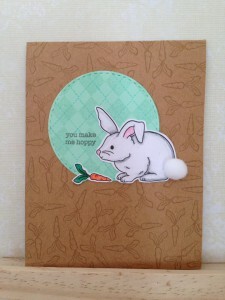 Next, I created a white card base. I added some embossed wood grain paper to the front of the card base. It was cream color. I added a strip of light kraft card stock. 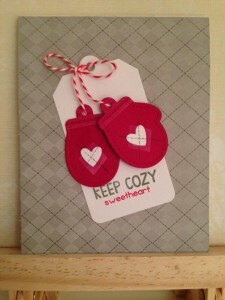 I used gold embossing powder to add the sentiment to the kraft panel. Lastly, I used foam tape to adhere the cows to the kraft panel.